Two weeks ago I was given a hunk of very orange volunteer squash by the nuns at the monastery. After I baked it in the oven I wanted to eat it all just plain, because it tasted that good, and as sweet as candy. But I had in mind to make soup using the same recipe that Kate (new nickname for my youngest) had found at Epicurious and cooked for us when she was home for Christmas. We collaborated on the soup, actually, and I’ll post here how we made it, not quite as the recipe instructed. For example, the recipe told us to take two 2# butternut squashes, bake them, measure out the flesh and use three cups of it, then “reserve any remaining squash for another use.” If I did that sort of thing the remaining squash would get moldy in the fridge or sit in the freezer for a year or two and dry out. So we used all our squash (when Kate made it we used the true Butternuts from my garden, and they don’t come in even pound weights, by the way) and increased some other ingredients proportionally. Brush or spray the cut side of the squash with olive oil and place cut side down on a baking sheet. Bake at 375° for about an hour or until tender. Scoop out the squash and measure it if you care to know how much you ended up with. Melt the butter in a large pot over medium-high heat. Add the onion, carrots and apple. Sauté 5 minutes. Add curry paste; stir 2 minutes. Add broth, bay leaves and squash. I used the bay leaves but Kate didn’t, and I liked her soup better, though I don’t know if it had anything to do with the bay. Maybe it was the variety of apple, or some other slight difference in our preparation. You have to accept this degree of inconsistency when you cook — well, I do. If it’s not the amounts of ingredients that affects the finished product, it’s the differences between one squash and another, or the change from 1/4 to 1/3 teaspoon of pepper that wasn’t measured. We are aiming for a hearty pot of soup, and not to become epicureans, even if we do like to search that website. Bring the soup to a boil; reduce heat to medium and simmer uncovered 1 hour. Now, we couldn’t figure out any reason to cook it for an hour unless it was to get the flavor of bay into it, and when Kate made it we didn’t have time for that. You really only need to cook it until the vegetables are tender. Discard the bay leaves, and purée the soup in batches in the blender or food processor. Return to the pot, stir in cream and honey and sour cream. Season with salt and pepper. Rewarm over medium-high heat. Divide among bowls and sprinkle with cilantro. I forgot to take a picture with the cilantro on top…. I just now noticed that the sour cream was for drizzling over the top of the soup after it is already in the bowls. That would be pretty! But we mixed ours into the soup, and it was very tasty. The sour cream and curry gave the bisque just the right amount of zip, though I suspect that some brands of the curry would add more heat than Thai Kitchen did. If you want something spicy you’ll need to add more curry paste. Even my husband, who despises squash, liked this soup! Mags, it is the fresh leaf form of the plant that makes coriander seed, very popular in Mexican cooking and also in Southeast-Asian. I buy it every time I am at the grocery store, since we like both types of cuisine so much around here! 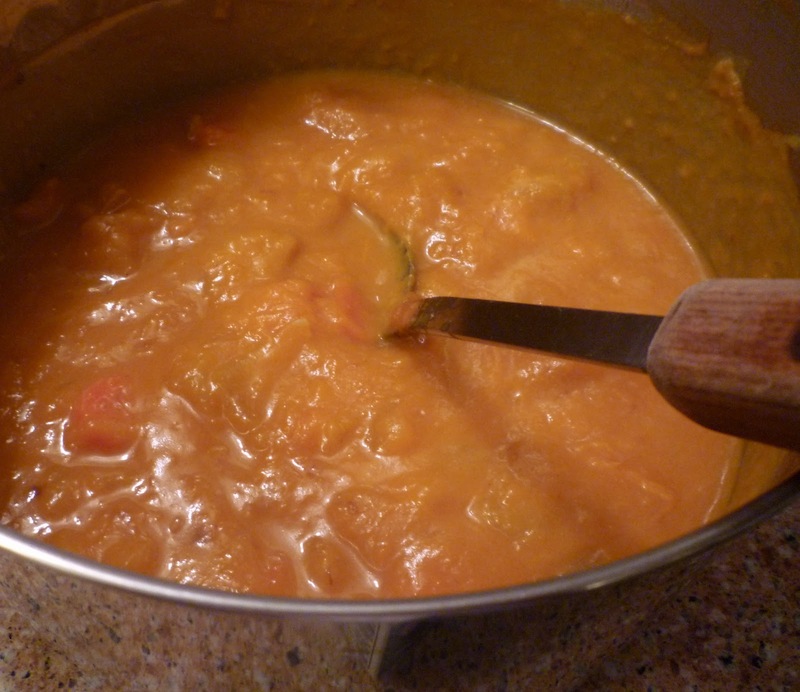 This sounds so good, but I am sure I would have to eat an entire pot of this squash soup. My men would pass on it. I do have a little butternut squash that I saved in my freezer. Perhaps I ought to make a small amount for myself! Mmmmmmmm….I would love to try a bowl. 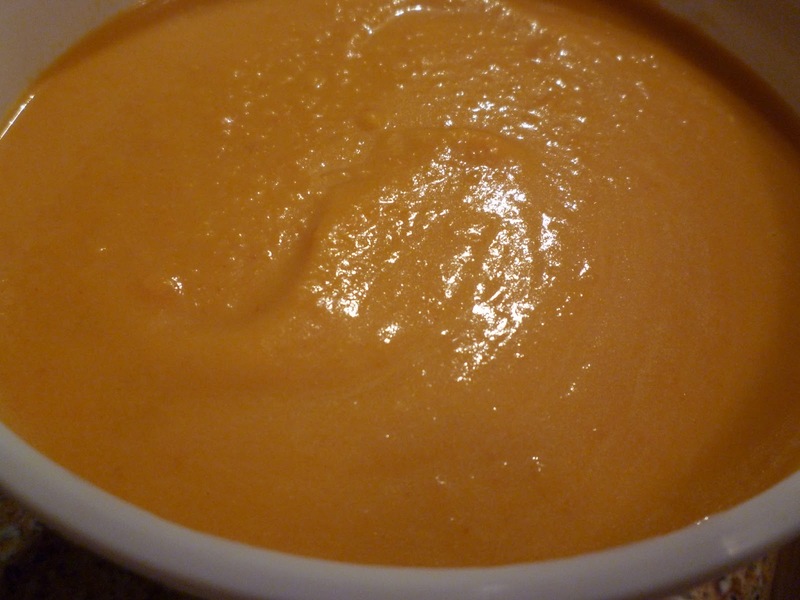 I do enjoy a bowl of butternut squash soup, and I have yet to try a recipe I have not liked. It is fun to find recipes that might have a new addition, as in your recipe. I have never used Thai red curry paste. I am especially anxious to try it since my husband loves me cooking with this spice. Yum… yum… yum… we can only get acorn squash here and I hope the store still has it because I am making this at the weekend… yum. I just saw this post! I'm so glad you got to use the recipe again! I honestly don't feel that bay leaves would go with the rest of the flavors… so that could be the difference, I suppose. But I bet it was great!